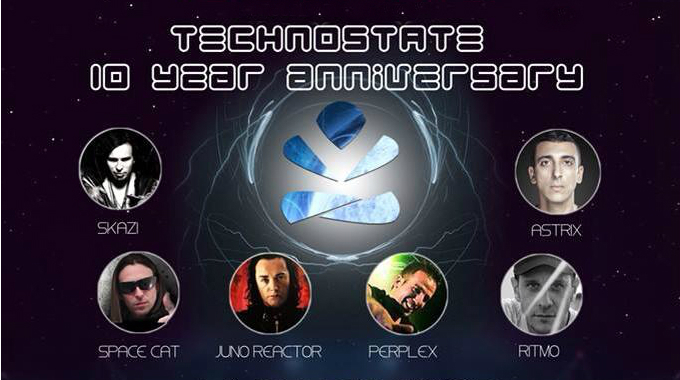 10 years ago 4 guys hooked up and started the new Club Technostate. It was Nick Psarros. Daniel Salan. Matte Björk and Micke Forson and the location was Källaren Diana in Old Town, Stockholm. The night was a success. After that they split up and Nick & Daniel continued with Technostate, and, after a while also Daniel dropped out, so now TechnoState is managed by Nick Psarros alone. With numerous parties, killer bookings and 10 years later the Technostate parties is now the Biggest Psychedelic parties in Sweden. Over the years they have booked names like: Astral Projection, Astrix, Hallucinogen, Kox Box, Neelix, Ace Ventura, Protoculture, Space Buddha, Etnica, Talamasca and a lot more. Now its time to celebrate BIG TIME, new BIG venue for up to 3400 people, with Amazing artists, killer sound, decor, laser show and a lot more. And, since we at bejbi.se, with #Podgressive podcast, Technophobia and BouleBar Globen has a party the same time, we offer everyone with a ticket to Technostate free entrance at our club. We open our doors at 19.00, so join us for some beer and boule .. and bass, of course!